Shopping! Now let’s be clear, outside of grocery shopping it is very rare that I go out with the intention of actually shopping. Sure I’ll go to the mall with Mrs. Iggles once in a while but that is done more in the name of ‘quality time’ and peace in the Iggles Household than anything else. But when I do go shopping I know exactly what I want and pretty much where I’m going to get it. So why is it necessary that I’m harassed by 4 salespeople in every store I step foot in? I appreciate the initial inquiry if I need help but once I say ‘no thank you’ than that should be it. Side Note: I always laugh when someone asks if I need help. 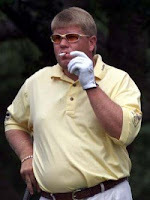 Asking me if I need help is like asking John Daly if he needs a beer. And like John there isn’t enough help out there that could fix me. Anyway, the ‘can I help you’ crap continues on until every salesperson in the store has interrupted me. Is this really necessary? The furniture store is the best….those bastards are like vultures following you around until you leave. There must be somebody that researches this kind of stuff….there is no way that these sales ‘tactics’ result in increased sales. So I have a simple rule…if I get asked more than twice if I need help I walk out. Don’t care what they are selling and I don’t care how good the price is. For furniture stores I only enter with Mrs. Iggles and let her deal with the salespeople……I just keep walking. This is so fun because Mrs. Iggles is the nicest person on the planet and feels bad if she doesn’t answer their questions. Meanwhile I’m coasting through the store in peace and quiet. FANTASTIC! For any Retailers out there I have some advice for you. Go walk into an Apple Store and see how they do it. They have one ‘Genius’ at the door that asks if you need help with anything and after that you are in the clear. No more questions and no more harassment. 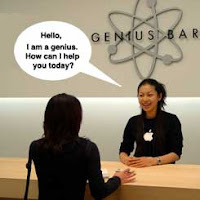 If you need help then you go find a ‘Genius’ and they always have like 10 of them standing around just waiting to help you. I could shop at the Apple Store all day long! I'd marry Apple if I could.